The last two months of 2012 were exceptionally busy! Grants took centre stage for much of my time. First writing for the NERC December 1st deadline was pressured as usual, and second response to reviewers comments on the July submission was interesting. Paper writing proceeded with reviewer and co-author comments on three manuscripts hopefully desitined for Review of Palaeobotany and Palynology (lead by Hayley), Palaeo3 (lead by Macrarena) and The Holocene (with Joe Williams) respectively. Four scientifc meetings were attended by group members: 1) British Ecological Society winter meeting at University of Birmingham (myself), , 2) American Geophysical Union congress in Sanfrancisco (Lottie), 3) Dutch and Belgian palynology meeting at the University of Amsterdam (myself), and 4) the Palaeo50 workshop at Oxford University (Encarni). Two tasks dominated the non-research activity: 1) teaching the Geological Record of Environmental Change (S369) exams assessment and assigment, and 2) as Post Graduate Tutor keeping up with NERC developments for the new Doctoral Training Partnerships. 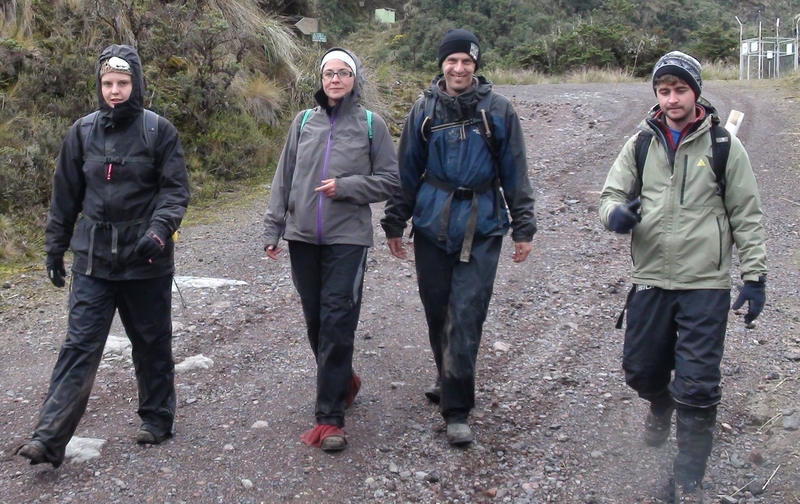 PCRG members on field work in Cayabe-Coca National Park (2012). Left to right: Hayley, Encarni, William and Frazer.